The holiday season is officially upon us. Although later we will be posting our suggested gifts for your friends and family, today we wanted to share with you the Fair Trade Federations Gift Giving Guide. 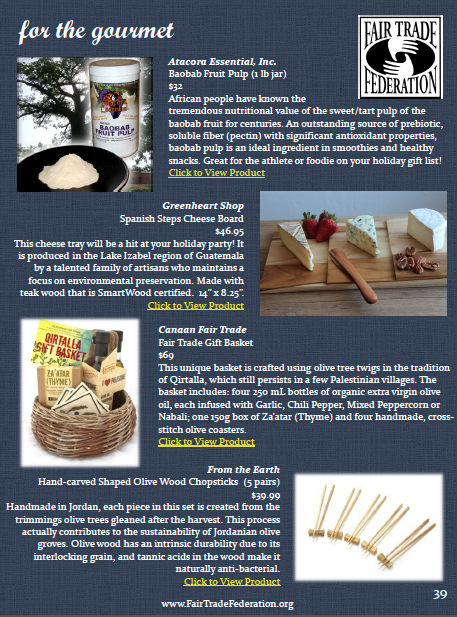 It is loaded with excellent, unique fair trade gift items produced by Fair Trade Federation Members. Rather than order items from the catalog, the catalog is really a look book, giving you the links to where you can order the products online. So helpful! From The Earth has a couple of entries in the catalog. Our popular Down Under Diva (US or UK) necklace appeared in their head to toe section. Doesn't it look good? In the gourmet section you can find our Hand-carved Olive Wood Chopsticks (US, UK). These come in 2, 4, or 5 pair sets. From The Earth was honored to have entries in this catalog alongside many other companies that have the same fair trade values. 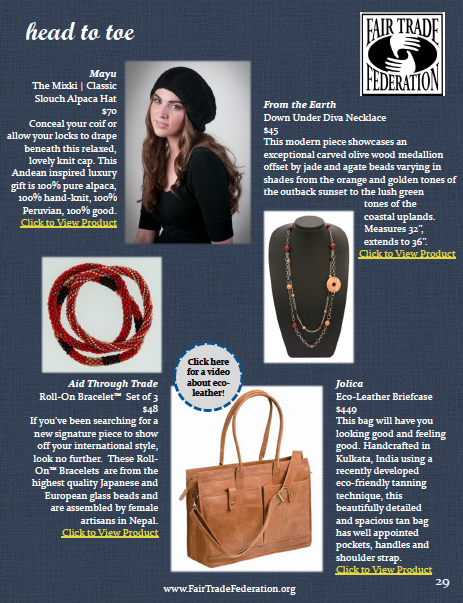 So remember, as you start your holiday gift giving, choose fair trade gifts.